29 Years ago, Milton Bradley introduced an electronic fantasy game called Dark Tower. The goal of the game was to collect the three keys necessary to open the gates of the Dark Tower and vanquish the forces within. To do so, you must travel through the land, exploring tombs, fighting brigands and hopefully not getting lost in the process. 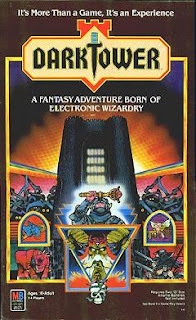 It seems quaint now, but in 1981 it had graphics far superior than most video games of the time (Dark Tower acheived this by lighting up pictures on a rotating cylinder). And the game play was actually quite engaging. Now you can try it yourself online: Dark Tower at HotFlashGames.